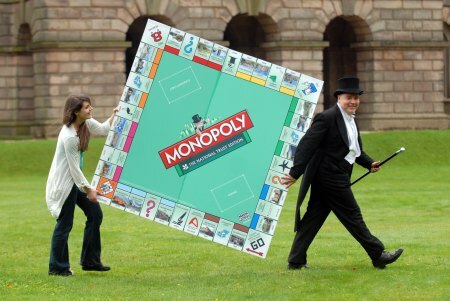 The National Trust has launched its own Monopoly set, featuring some of its finest stately homes and countryside sites. The set is the first ever charity version of the game. The most expensive properties on the board, Mayfair and Park Lane, will be Lyme Park in Cheshire and Hardwick Hall in Derbyshire respectively. Lyme Park was made famous by Colin Firth‘s Mr Darcy emerging from its lake in the BBC’s adaptation of Jane Austen‘s Pride and Prejudice, and Hardwick Hall is one of Britain’s greatest Elizabethan houses, built by Bess of Hardwick. Other National Trust choices include Snowdonia in place of Bond Street, the gardens of Stourhead as Fleet Street, 20, Forthlin Road, the childhood home of Sir Paul McCartney, as Old Kent Road, and the 19th-century Birmingham Back to Backs as Whitechapel. The Trust Monopoly set features 26 places across England, Wales and Northern Ireland, including beaches, a lighthouse, an Industrial Revolution mill and Sir Winston Churchill‘s family home. Houses and hotels are replaced with visitor centres and holiday cottages, and community chest and chance cards feature scenarios such as ‘Health and Safety Inspection. Pay £50’ and ‘Fundraising Appeal Does Well. Collect £150’.